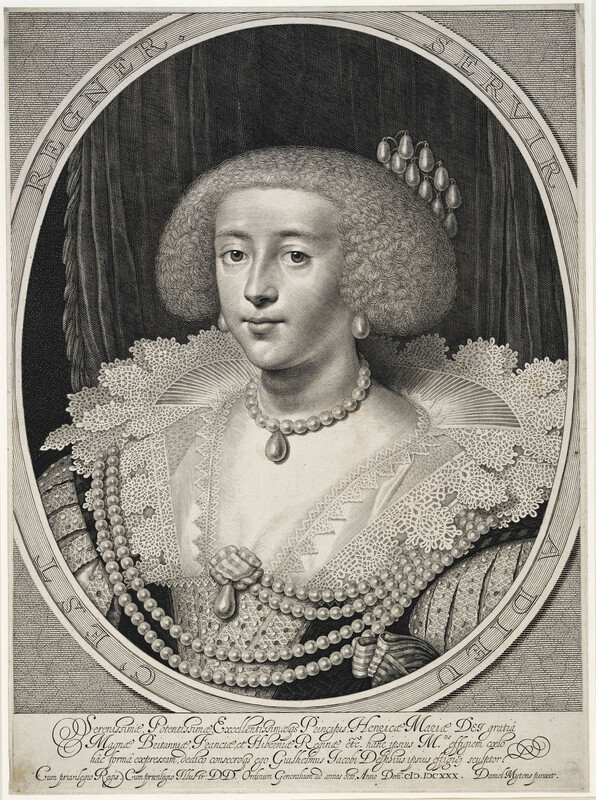 Engraving of Henrietta Maria as queen. Bust length with curled hair with pearls, pearl earrings and necklace, open lace collar, low gown, and lace bodice with pearl ropes. Within an oval border bearing Latin inscription. Very fine. For the corresponding portrait of Charles I, see RCIN 601534. Presenting 28 masterpieces from the Royal Collection, the exhibition includes works by Gerrit Dou, Gabriel Metsu, Jan Steen and Pieter de Hooch, and Johannes Vermeer's 'A Lady at the Virginal with a Gentleman'.